Galway sub Peter Cooke takes on Mayo's Aidan O'Shea in action from the Connacht GAA Football Senior Championship quarter-final at McHale Park, Castlebar, Sunday. It was a tense and at times turgid Connacht quarter-final clash on Sunday afternoon - that was until Galway set McHale Park alive in injury time to seal victory by 0-12 to 1-12. At 0-11 to 0-11 apiece and three minutes into added time, it would have been either a brave or foolish person who would have put their monthly mortgage or even a fill of diesel on who would win the game. At that stage, a draw was beginning to look likely, even with five minutes of injury time left to play. Then three Galway substitutes made their mark. The supreme craftsman who is Ian Burke, the strong running and continually improving Seán Kelly, and Adrian Varley combined to set up the galloping Johnny Heaney who walloped a stunning goal to the back of David Clarke's net. In a game that lacked exciting passages of play - although entertaining and intriguing from a tactical point of view - Galway's goal was a thing of beauty and worth waiting for. 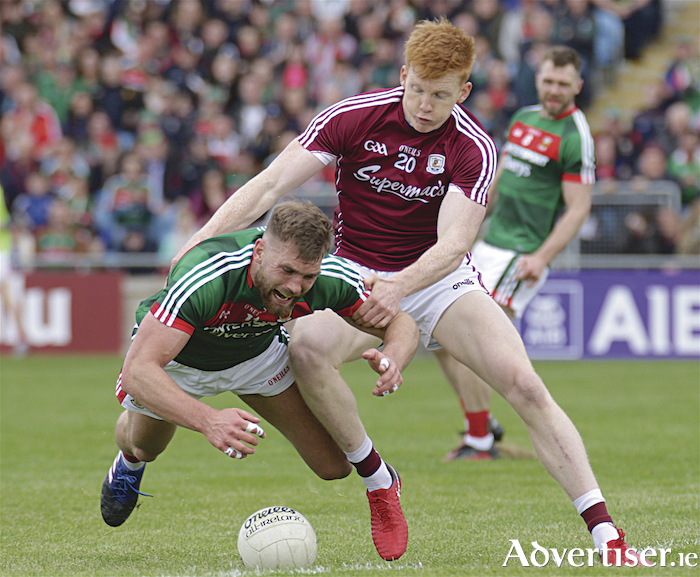 Taking a three-point lead at that stage meant only a mini defensive collapse from Galway would allow Mayo back into the game. Then, when Athenry's Tom Flynn, who had re-entered the game for the black-carded Peter Cooke, caught a stunning kick-out from the impressive Ruairí Lavelle, everyone in the 29,000 plus crowd knew the Mayo goose was cooked. In Connacht at the very least for 2018. Galway manager Kevin Walsh has said throughout his four-year tenure that to win big games a team must have serious strength in depth, and from that perspective it would have be gratifying for him and his backroom team to see all six substitutes come onto the field of play and make a positive impact. The influence of Ian Burke up front, Eamonn Brannigan for his power running, Seán Kelly for his terrific reading of the game and link play, Peter Cooke for the injured Paul Conroy, and both Adrian Varley and Johnny Duane, were a huge factor in Galway getting over the end line. It also means there will be hair and skin flying at Galway training over the next few weeks as players try to get their names on starting jerseys for the Connacht semi-final against Sligo on June 3. Hopefully Michael Daly will be back to full fitness and championship form soon too, and the Mountbellew man at full tilt would be another string to Galway's forward bow. Obviously with club championship games this weekend and a week of tough training the following week, there is always a risk of injury, but that is unavoidable and is the same for every other county in the competition. The one player off the bench who really seemed to unsettle the Mayo rearguard was Ian Burke. His tremendously fast hands and brilliant off the ball running was a joy to watch, and Mayo's Eoin O'Donoghue found him far too hot to handle. The Corofin man, who is off the back of an immense season at club level, often plays football at a different level and in a dissimilar way than most forwards. His innate talent and ability to see defence opening passes when on the ball and bring other teammates into play will be crucial in the coming months if Galway are going to unlock some of the best defences in the country. Burke can be a huge player for Galway if he remains injury free and gets into a good groove. Lest we forget, he hit 0-5 last year against Kerry in the All-Ireland quarter-final and his link play was stunning against Donegal when the side scored 4-17, with Johnny Heaney notching 2-2. The thought of him in the inside line getting good ball with powerful running forwards such as Comer, Walsh, Heaney, Kelly, Brannigan or big midfielders like Duggan, Flynn, Conroy or Cooke on the overlap, is an exciting prospect. While it was great to beat Mayo for a third year in a row, Kevin Walsh will not need reminding that his players did some silly things over the 78 minutes of play too. The forwards dropped the ball short at least five times into David Clarke's hands and that needs to be eradicated for the tests that lie ahead. Shane Walsh, who hit three glorious points, was one of the biggest culprits, and he needs to settle on his shots and compose himself more. At the back, too, some of the fouls for scorable frees for Mayo need to be cut out. Conor Loftus was gifted a few easy ones and Kevin McLoughlin could have popped one or two others too. Teams with top freetakers will punish any of those indiscretions. Overall, though, it was a commendable performance from the squad. From Ruairí Lavelle, who found his men well, up to Barry McHugh who kicked two fine frees, every Galway player worked hard. Ciarán Duggan really caught the eye with two superb points and a few massive fetches. His improvement over the past few months has been superb, and not reflects well on him, but also on the training and work that is going on in a myriad of ways within the squad. Nobody in Galway is getting carried away after beating a team that was down to 14 men for more than 40 minutes, and was without one of their best players. However, Galway are making genuine progress and are now difficult to beat. People may not like Galway's new defensive shape, but the team has only conceded one goal in nine games and that was a bit of a fluke for Kieran Hughes in the final minutes of the league game against Monaghan, so it is impossible to deny it is extremely effective. With a few modifications at the back and a bit more support at times for the forwards when they are in possession, who knows where the Galway footballers could end up over the next few months? Galway: R Lavelle; D Kyne, SA Ó Ceallaigh, E Kerin; G O’Donnell, G Bradshaw, C Sweeney; T Flynn (0-1 ), C Duggan (0-2 ); S Walsh (0-3, 1f ), P Conroy, J Heaney (1-0 ); S Armstrong (0-1 ), D Comer (0-2 ), B McHugh (0-2, 2fs ). Subs: P Cooke for Conroy (inj ); E Brannigan for Kyne; I Burke for Armstrong; S Kelly (0-1 ) for Flynn; J Duane for Bradshaw; A Varley for McHugh; T Flynn for Cooke (black card ). Mayo: D Clarke; E O’Donoghue, C Barrett, K Higgins (0-1 ); C Boyle, S Coen, P Durcan; T Parsons (0-1 ), S O’Shea; K McLoughlin (0-2 ), A O’Shea, D O’Connor (0-1 ); C Loftus (0-3, 3fs ), A Moran (0-2 ), J Doherty. Subs: C O’Connor (0-1 ) for Parsons (inj ); D Drake for Loftus; J Durcan for Doherty; C Hanley for S O’Shea; D Vaughan for Moran; B Harrison for O’Donoghue (inj ).